Plantain also known as ‘’Musa Paradisiaca’’ has been used throughout the world as food and medicine. It has been tested scientifically for the treatment of diarrhoea, diabetes, dysentry, injuries, malaria, and ulcer. Plantains are famed to be diuretic and also can help prevent kidney and bladder problems. Plantain is basically cooked and served in many dishes as the chief carbohydrate source in most parts of the world. The fruit can be roasted or fried as food. In Nigerian it is called bole when roasted and dodo in some Nigerian languages. The ripe fruit can also be eaten raw as fast food. This plant known as ogede or ogede agbagba in Yoruba, Oghede in Benin, Ayaba in Hausa, while it is known as abereka, ojioko and ogbadejieko in Igbo, is rich in vital vitamins and minerals, it has soft trunk with lots of fluid. Plantains are rich in certain vitamins and minerals that contribute to good health. Plantains are available at most local markets, large grocery stores and can add new flavours and recipes to your healthy-eating plan. Research shows that, plantain relatively has more calories weight for weight than that in the fruit bananas. 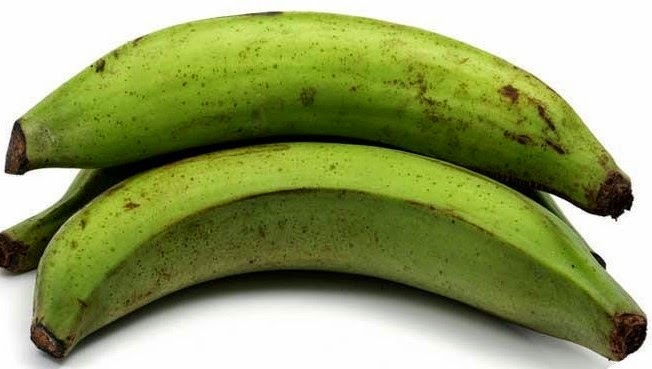 100 g plantain holds of 122 calories, while dessert banana has only 89 calories. Indeed, they are very reliable sources of starch and energy; ensuring food security for millions of inhabitants worldwide. It has more vitamin C than bananas. 100 g provide 18.4 mg or 31 per cent of daily required levels of this vitamin. Consumption of foods rich in vitamin-C helps the body develop resistance against infectious agents and scavenge harmful oxygen-free radicals. Plantains have more vitamin A than bananas. In addition to being a powerful antioxidant, vitamin A plays a vital role in the visual cycle, maintaining healthy mucus membranes, and enhancing skin complexion. 100 g fresh ripe plantains contain 1127 IU or 37.5 per cent of daily required levels of this vitamin. Besides being a powerful antioxidant. Vitamin A is involved in numerous bodily functions including reproduction, immunity and communication between the cells. Experts asserts that plantain has vitamin-B6 (pyridoxine), in which pyridoxine is an important B-complex vitamin that has a beneficial role in the treatment of neuritis, anaemia, and to decrease homocystine (one of the causative factors for coronary artery disease (CHD) and stroke episodes) levels in the body. For healthy living, men need between 30 and 38 grams of fiber a day and women need between 21 and 25. Getting these adequate amounts of fiber promote an efficient digestive system, which can prevent constipation, haemorrhoids and diverticular disease. Eating plenty of fiber can lower your cholesterol level, which might reduce your risk of heart disease.